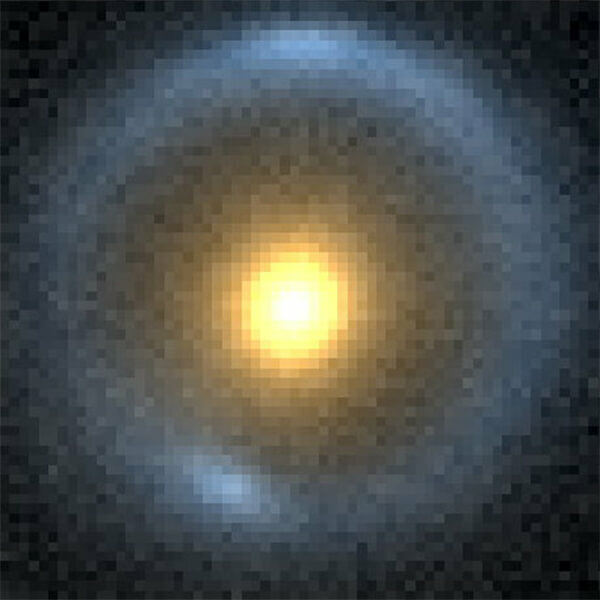 ABOVE: This image shows A dwarf galaxy found by MIT’s Dr. Simona Vegetti and colleagues –a satellite of an elliptical galaxy almost 10 billion light-years away from Earth. The team detected it by studying how the massive elliptical galaxy, called JVAS B1938+666, serves as a gravitational lens for light from an even more distant galaxy directly behind it. Astronomers have realized they may have underestimated the number of galaxies in some parts of the universe by as much as 90 percent, according to a study in 2011 by Matthew Hayes of the University of Geneva’s observatory, who led the investigation using the world’s most advanced optical instrument — Europe’s Very Large Telescope (VLT) in Chile, which has four 8.2-meter (26.65-feet) behemoths. They turned two of the giants towards a well-studied area of deep space called the GOODS-South field. In the case of very distant, old galaxies, the telltale light may not reach Earth as it is blocked by interstellar clouds of dust and gas — and, as a result, these galaxies are missed by the map-makers.“Astronomers always knew they were missing some fraction of the galaxies… but for the first time we now have a measurement. The number of missed galaxies is substantial,” said Matthew Hayes of the University of Geneva’s observatory, who led the investigation. The team carried out two sets of observations in the same region, hunting for light emitted by galaxies born 10 billion years ago.The first looked for so-called Lyman-alpha light, the classic telltale used to compile cosmic maps, named after its U.S. discoverer, Theodore Lyman. Lyman-alpha is energy released by excited hydrogen atoms. The second observation used a special camera called HAWK-1 to look for a signature emitted at a different wavelength, also by glowing hydrogen, which is known as the hydrogen-alpha (or H-alpha) line.The second sweep yielded a whole bagful of light sources that had not been spotted using the Lyman-alpha technique. They include some of the faintest galaxies ever found, forged at a time when the universe was just a child. “If there are 10 galaxies seen, there could be a hundred there, unseen” said Hayes. The 10 CREEPIEST Places on Earth!